Isaac Tigrett’s Krishna with flowers – beneath his flat in the ashram. The flat is now vacant. He has joined the Muddenahalli Group. The term guru means one who dispels the darkness of ignorance. Gu means one who is beyond attributes (gunas), ru implies one who is beyond forms (rupas). This refers only to God. That is why the guru is hailed as Brahma, Vishnu, or Siva. Only God is the true guru. All others are merely teachers, like the teachers of different subjects in a college. Guru is the one who reveals the guri (target) to the disciple. Guri here refers to the Aathmic Principle. Picture taken on Gurupoornima late afternoon 2011 – just months after Sai Baba passed. 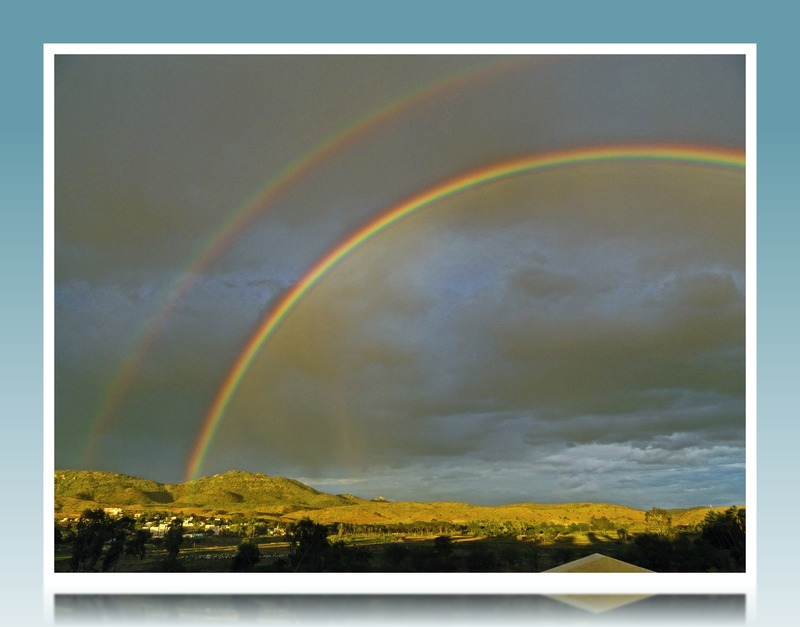 Notice two rainbows in the sky – they appeared after a storm about 5 p.m. that evening. 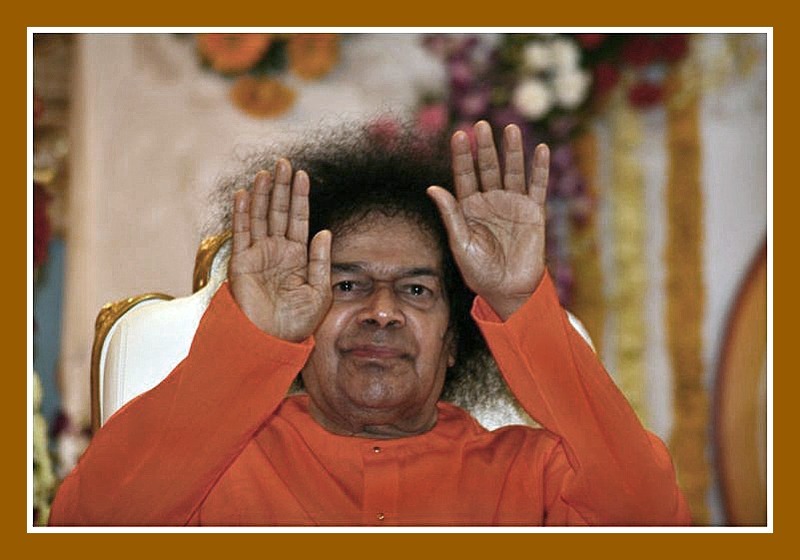 What is the Significance of Sathya Sai Baba’s Samadhi? ~ We learned from Swami all the important practises of an aspirant and how to achieve the highest from our practise. One of the most important spiritual practises that one can incorporate into regular puja is daily worship at the “jeeva samadhi tomb or shrine.” (Samadhi) The reason being that the guru’s presence is still alive, although not seen, but still conveying energy to all who seek. The shakti energy remains forever in the Shrine of a powerful teacher – much the same as it did during his life-time. That is to say his energy radiated out to seekers through the body while he was alive, but now the “same energy” radiates to all from His Shrine. Sai Baba is still working through his vibration, much as he had done over the decades while alive. Today, Sai Baba’s Samadhi has a concentrated energy force that permeates all areas of his ashram. Very much like a vortex of a storm, this energy or shakti is far-reaching. The uplifting vibrations are apparent in and around the Shine, embedded as they are, in every nook and cranny of the immediate area of the Samadhi. The guru’s shakti has now become a forceful tool for enlightenment. For those who come to the Shrine to worship and practise, there’s nothing better than the vibrations of the late Sai Baba. The jeeva samadhi shrines/samadhi of any great gurus can lead aspirants further toward their chosen spiritual goal. The most important first step in all of spiritual life is awareness, thus the guru is the very one to point that out. Every human-being has the In-dweller source, it is the guru’s job to seek out our very own In-dweller, the liberator of our souls. Often it takes someone with a powerful shakti to drive us inward to where the source of our being is waiting to be discovered. Our own In-dweller lays dormant until we are awakened by the forceful shakhi of a true guru/spiritual director. Thus, the search for the In-dweller, the one without a second, is the quest of all living beings. Isaac Tigrett talking with Sai Baba at darshan in 2009. Easter Sunday 2011 is the saddest day in the memory of millions of Sai Baba devotees world-wide. It was the day He passed away. The day we never thought would come, but come it did and earlier than we had expected. It was the day “Love All – Serve All” died too. I use the term Love All – Serve All, because it is a well known quotation associated with Swami and is the one loved the most and its meaning is associated with everything Sai Baba taught over the years. 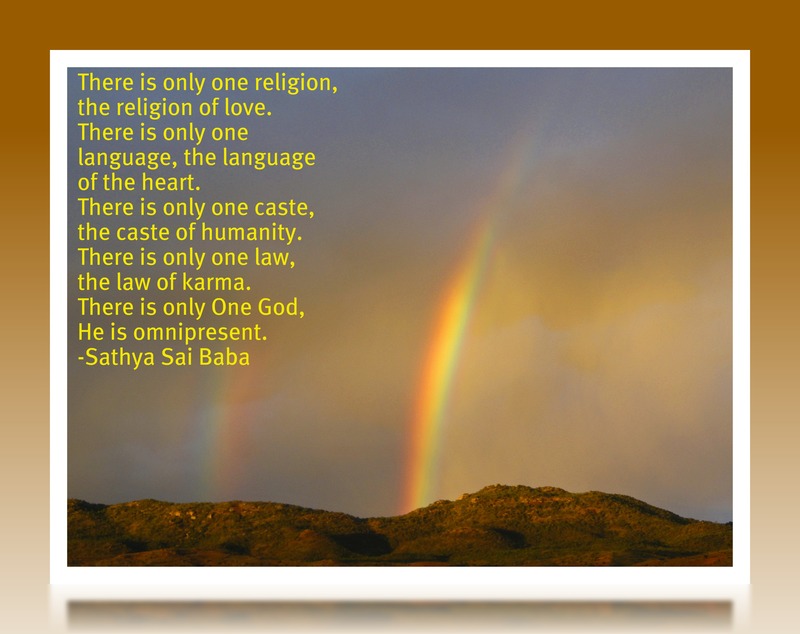 So what did Love All – Serve All really stand for during Sai’s life? Well, ‘what didn’t it stand for’ might be the better question to ask. Swami had for decades, come rain and shine, come pain or illness, gave two daily darshans to the huge crowds gathered at one or the other of his ashrams. I only remember Him ever missing darshan one month, that was during his recovery from His hip replacement surgery in June 2003. I was there in Whitefield at the time, on looking back, I keenly remember how miserable and utterly soul-destroyed we all were due to not seeing our Baba, the “One Light” that so filled us with joy and energy. When the month was finally over, He gave a glorious come-back darshan sitting on a gulf buggy. I swear it was the longest darshan I’d ever had. He also gave a detailed talk about His hip operation on that day, July, 5th, 2003. He said, “I am not this body. Body consciousness leads to untold suffering. One has to get rid of body attachment in order to enjoy peace and happiness. What is this body composed of? it cannot cross the ocean of Samsara. It is nothing but a structure of bones. He also gave other hints during that talk that his time with us would not be long. And although we thought the buggy was temporary, it wasn’t. Swami no longer walked among us after the operation, he used a variety of vehicles such as the famous golf buggy that, I believe, he first used in the Whitefield Ashram and later on he used a small car, then during the last years a wheelchair. He moved among us for another six years, although the last year He appeared extremely ill and with the additional handicap of two strokes. His strength began to fail. Still, even then he came to darshan often, never giving in to the horrible suffering of that little impermanent body, that he told us he had no attachment to. His message remained the same: My Life is my message. My life is one of giving and sharing with others. I give you what you want, so you will want what I have come to give. Love all, Serve all. Love ever, Hurt never. The message he gave was always the same message, only made different by the quotations and words He chose to pass on this all-important lesson, that we are born to live, love, share, and adhere to the highest values of human life. Heart-felt grief hit all of us on the day He left his little body. Life would never be the same again. We had lost our “Sai Light” – our “Radiant Sai,” the giver of joyful bliss, often coupled with hard life-lessons too. We were forced to face the future that would not include a physical Sai Baba. That beautiful form. He would not move among us in the flesh again. We had to do as He’d done, move on. Move on to a higher practise, one that required us to mature and seek the God within. Isaac Tigrett had made the quotation, “Love All – Serve All” famous by using the slogan in his numerous Hard Rock Cafés, dotted all over the world. He’d been instrumental in the building of the now famous hospital in Puttaparthi. Isaac Tigrett had given a donation towards the building of that beautiful building. Oddly enough, he’d been living in the ashram at the time of Swami’s passing. He had predicted that Swami would die early in his 2009 Dallas talk, and he told us afterwards, that Sai’s passing had been no surprise to him. In the whirl-wind of change taking place in that empty space left by the physical Sai Baba, things were changing fast. We had the drama where Mr. Tigrett claimed Baba had instructed him to build a retreat and a school somewhere in Coorg. He’d called it the 7th Ray. He was given the name, the “Living Will” by the press, however, things did not go to plan. Meanwhile, in the small hill-top hamlet of Muddenahalli something else was unfolding, something none of us could have or would have ever imagined! Mr. Murthy, a long time devotee and senior officer there, claimed the spirit of Sai Baba contacted him, whereby instructing him to build schools and hospitals. He also claimed he’d had vivid dreams of Sai Baba. A few years later during 2014, Mr. Murthy and friends, Madhusudan and Isaac Tigrett attended a gathering of former VIP and studnets in Kodaikanal. It was during that rather impassioned meeting that the “Muddenahalli Baba” aka as “The Light Body” or “Sukshma Baba,” became the invisible source for everything Sai Baba. Apparently, we learned, Sai Baba’s “subtle body” was using the former student to talk through! This affair had all the hallmarks of being delusional, because Sai Baba had often given speeches during his life-time, condemning those people who claimed he spoke to them. He said, time and again, he needed no one’s help to communicate messages. He had entire control over the universe and on all levels of life both living and dead, astral and causal. Yet, all written statements and video clip from Sai Baba, declaring He was beyond normal needs of communication and, whether in the body or not, He could contact anyone at any-time, or anywhere. Space and time were no barrier. This all fell on deaf ears. People flocked to Muddenhalli! There, they could relive their old darshan days once more, by following Madhusudan who mimicked Sai Baba’s every action. Now, three years later, we see a bold Madusudan who not only mimics Sai Baba, but also can “produce” rings, create vibuthi and now, on Maha Shivaratri, cough up a lingam!– just like his mentor and teacher, Sai Baba had done all those years ago. Perhaps, too, we still have many grieving and lost former Sai followers who cannot make the transition from dual to non-dual; the very fabric of Sai’s teaching; The core value of his teaching; The highest of his teachings! Whatever has happened, we now have a sad situation of a “wannabe” Baba, soon-to-be a fully-fledged Baba, all-be-it utterly contentious, acting out on behalf of many gullible people, who cannot bring themselves to accept that the old order has passed away. Not only that but the former Student now has a fly-by-night following world over. There’s to be a new ashram in Ca. USA, probably in the form of a retreat, come ashram, 7th Ray style perhaps? for Madhu devotees to revel in. Whatever joy and monies may be made out of this new cult, remains to be seen, or even if it can stand the test of time. Our Sai Baba stood the test of time, his presence permeates every stone of the ashram, every tree, every flower, every brick, every cat and dog, every monkey, every insect and every heart and soul there. Until such time we listen to our Wisdom teachers, all of whom tell us God is within, we will always have the three GMMM – God Mullah-Making- Machines – only too willing to part the gullible from their money and commonsense. 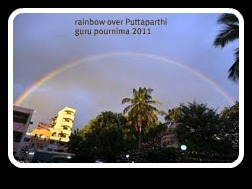 Those Guru Purnima Rainbow Photos Again! ♥♥♥♥♥♥♥It is said that on the other side of the rainbow there’s gold. That I do not know! But I know on the other side of that computer there is a person who is worth gold! Glue it on the wall of those you respect or love. \(^_^)/ You know that I love you all, & praise God you are in my life today.